NEW ORLEANS — MISO will attempt to divide its ongoing market platform replacement into a series of smaller agreements with vendors rather than one large contract with an outside party — a move that could affect the project’s timeline. MISO Vice President of Market System Enhancements Todd Ramey last week said the RTO can “lean on” its legacy platform system a little longer than originally anticipated if necessary. It was planning for a complete swap-out by 2023, under some pressure from existing platform vendor General Electric, which originally said it would also end IT support for the platform around that time. “So quite a bit more runway if we need to do that,” Ramey said during a Board of Directors meeting Thursday. Director Barbara Krumsiek half-jokingly asked for assurances that it won’t take until 2030 for a complete replacement. “We’re working hard to make sure we can make the transition much sooner,” said Ramey, adding that MISO’s goal is to stick to its original timeline. He stressed that the RTO has not yet found any reason to extend use of the legacy platform and hasn’t made any such decision. The multi-contract move will negate MISO’s earlier plans to reveal a chosen single vendor at the beginning of 2020 after finishing an evaluation of alternatives to GE. MISO will provide its next update on the platform redesign to the board in June. Ramey said staff are already training members on how to work on the new platform. Noting that cybersecurity was one of the reasons MISO cited for moving to a new platform, Director Thomas Rainwater asked RTO executives to include an update on how they will bolster cybersecurity measures if they prolong the use of the legacy system. At a March 19 meeting of the board’s Technology Committee, Director Baljit Dail asked if GE might have any expectations of a single, large contract. MISO Executive Director of Market Development Jeff Bladen said GE was in agreement about moving forward with a series of smaller agreements. 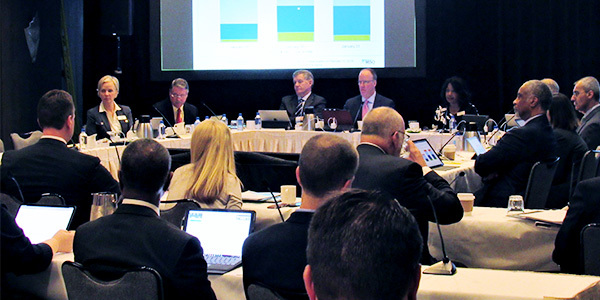 Additional research has reinforced earlier projections that MISO’s market platform will become obsolete in five to seven years, RTO executives told members of the Board of Directors.